If you are looking for information on the Trick Shots franchise business opportunity, Trick Shots franchises or Trick Shots franchising, then you have come to the right place. "One of the Fastest Growing Sports in America"
We thank you for exploring Trick Shots, one of the most exciting franchise opportunities available today. Trick Shots has little to no competition in the franchise world. This is the only franchise of its kind, offering a full service liquor bar and an up-scale poolroom in cities across the United States. Trick Shots Billiards was started in September of 1995 by four investors. The common goal was to create a chain of up-scale billiards clubs that would improve the image of the billiards industry in the states. A proven retail formula that will give you everything you need to run a successful billiard room. We advise you how to pick out the best location and how to set-up your billiard room to generate the most money. We also show you how to attract the clientele you want! 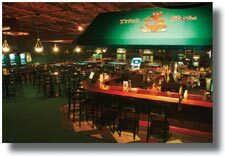 It is a strong proven business model having built 5 corporate units across Central Florida area, making it the largest billiards chain in Florida. 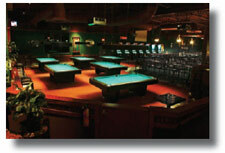 Our goal is to become the #1 billiards chain in the U.S. over the next 5 years through franchising. Growth of Billiards: Billiards is now an established mainstream recreational activity. One of the first things you'll want to do is identify your location. Trick Shots will work along with you and review your choices of locations. On average these locations are sized between 6,000 to 8,000 square ft. and are either located within strip centers or are freestanding facilities. A Trick Shots location not only needs to look great but it also needs to be functional. Trick Shots has developed a computer animated 3-D imaging system. Once your dimensions for your location have been submitted, our system will create a 3-D image of your location as it will appear when completely outfitted as designed. You'll know what your Trick Shots will look like once completed and from this all of your interior needs will be ordered and built out to plan. We offer a build out package according to your specific location. It's that simple.